Yeah, this might look familiar. I did something similar, very similar, in a sketchbook some time ago. Yesterday I just wanted to draw. Just draw, from observation. I didn't want to think about what I was drawing. I just wanted to look at what I was drawing. Just look. I'm also calling this Everyday Matters challenge 164. 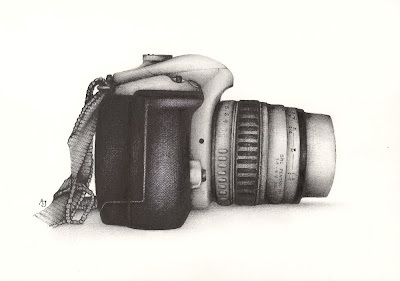 Which is draw a camera. Obviously. I would just love to see you create what you do one day. Amazing. Beautiful and amazing. Simple and very nice. I like it. it wasn't in a crowded hazy bar, was it? Gosh - your drawings never cease to amaze me! I love this. hey...if u have tym....plz check out my blog.."compulsive drawing disorder" ... i just started it a few days back...plz give suggestions to improve. Ah, the mindful work process from which all the greatest creations seem to come. Your eye for detail and texture is just amazing! Wish I could pick up a pen and say I just want to draw and come up with something so precise and yet with such character! You are always so good! I love it! You're so incredibly good! What pens/pencils do you use? Excellent! Had to bookmark your blog! Beautiful rednering of your camera! Annie Sarah, I've used a couple of black fineliners in this - Faber and Pilot. I have also used a HB, 2H, B and 2B pencils. Any brand, I don't have a preference. G, nice link. Thank you. I'll give it a go. Wow, Andrea! I so love your soft tones, amazing. And those fast cat sketches - so beautiful! Oh, wow, such incredible detail in your drawings! I'll have to stumble across your blog more often! Great EDM challenge.